The Red Devil Create-A-Color® Custom Color Caulk Mixing System is a simple and easy way for anyone to create custom-colored caulk in minutes. This patent-pending system allows on-the-job coloring of a single tube of caulk using ordinary latex paint. Watch the color change right before your eyes - the results are amazing! A must-have systems for painters, decorators, contractors, tile installers, masons, plumbers, wallpaper hangers, and even home-owners! This innovative system allows you to match your caulk with fixtures, countertops, tile, walls, wallpaper and more. 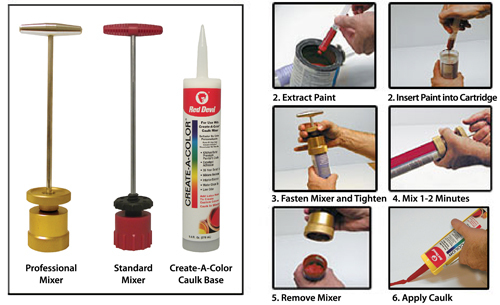 The Create-A-Color® Custom Color Caulk Mixer is designed for use exclusively with Create-A-Color® Caulk from Red Devil, Inc. NOTE: Latex paint must be purchased separately.